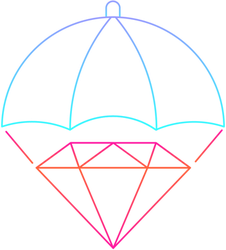 Qravity is a digital entertainment production and distribution platform where decentralized creative teams get royalties for making movies, games, music, and more. The Qravity QCO sale will be back! As we continue to build partnerships and improve the Qravity platform, we’re pausing the token sale. You’ll be able to get QCO again very soon - sign up to our newsletter for updates. 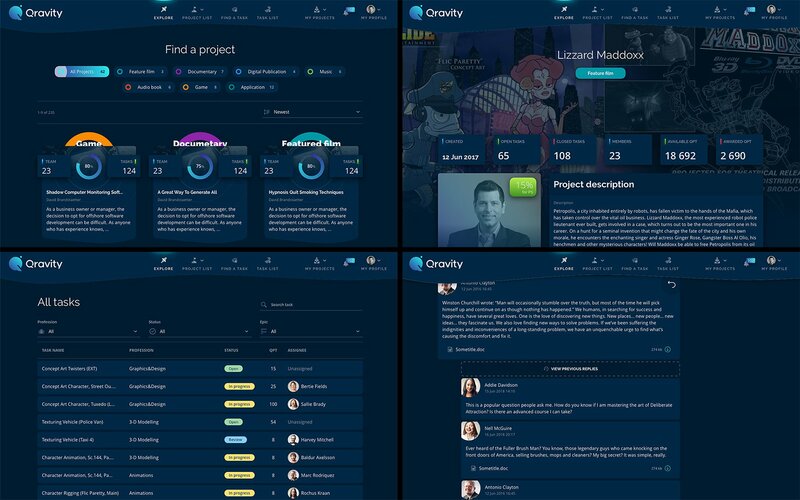 Qravity helps people with great ideas assemble, manage, and pay creative teams to produce original premium movies, video games, music, and more. Creators get stakes in the projects they produce with Qravity, which only hosts and distributes monetizable premium content. Content creators receive stake-based royalties whenever their content is consumed. The more successful their creation, the greater their earnings. Qravity makes it easy for content creators to form successful working relationships and build a productive and collaborative community. A full suite of professional project management tools keeps content development on course at every stage, from planning through production right up to distribution. Hands-on collaboration tools facilitate communication between distributed creative team members, and track each member’s contributions. Always secure and transparent, Qravity streamlines creative workflows and strengthens collaboration. We prepared demo version for you. Try it now! 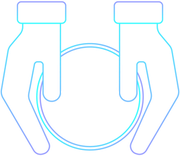 Qravity uses two tokens: Qravity QPT to track project ownership, and Qravity QCO for monetary transactions within its content creation and distribution processes. Qravity only hosts commercially viable content. Unlike existing freelancer marketplaces, we review project proposals carefully and select those with high market potential to ensure profitability for all project stakeholders. Blockchain technology brings transparency to collaboration, distribution, transactions, and profit-sharing, while removing middlemen and financial barriers.  Immutable smart contracts facilitate trust in a truly digitized work economy, protecting copyrights, and ensuring fair compensation for content creation and project management. 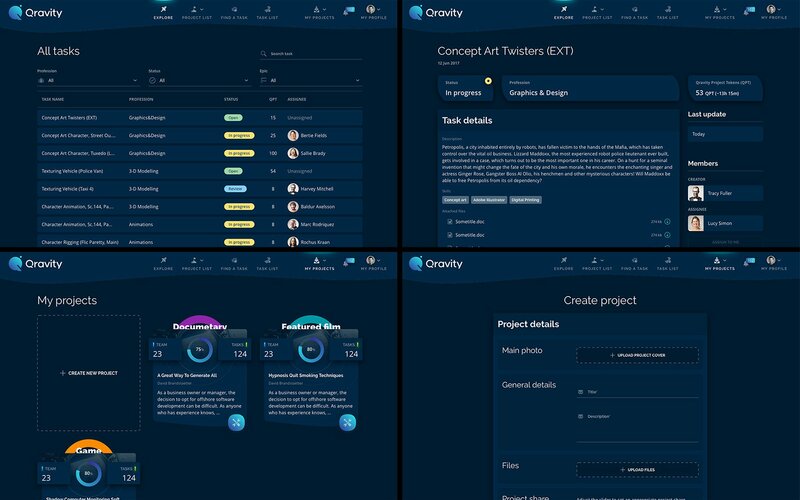 Even as a working prototype, Qravity's suite of professional project management tools already includes asset production and approval, file sharing, and messaging. The Qravity community gives creatives a space to collaborate and share their talents, and access to an abundance of resources and knowledge. Wireframe development of the Qravity platform begins. Funding helps advance platform conceptualization and initiate development. Planning and integration of project stages and functionalities begins. Working version of the Qravity platform complete. Testing begins. New features added. Planning for blockchain integration begins. Qravity QCO available through token sale, with bonuses for early contributors. Qravity will present the platform and its pilot project at MIPCOM, the world's largest entertainment content market. Platform launch. Production of Lizzard Maddoxx begins. Following the platform launch, production starts on Qravity's pilot project, a 3D animated feature film called Lizzard Maddoxx. Once the platform is updated according to beta testing results, Qravity will start accepting content proposals. Release of the first digital content production to be developed, distributed, and monetized exclusively with Qravity. 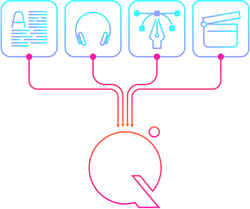 As we continue to develop our game-changing digital entertainment production and distribution platform, we’re pausing the sale of Qravity QCO. Sign up to our newsletter so that we can keep you up to date on all the latest information about the platform and our token sale. Qravity QCO is an Ethereum ERC-20 token that serves as the cryptocurrency used for all Qravity transactions. Qravity pays royalties in QCO every time a distributor licenses content or a consumer buys or rents platform content. This model is similar to existing distribution and streaming models and uses QCO as its cryptocurrency. This makes project revenue transparent for all stakeholders. 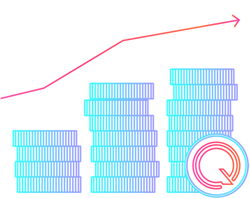 As a blockchain technology, QCO ensures that all project contributors, and Qravity itself, receive their fair share of their project's income. Christian is a prolific entrepreneur and angel investor who operates across a wide range of industries, including biotechnology and medical diagnostics. He has set up several successful global biotech startups, and co-founded Tectonic Slide Entertainment and Qravity. With knowledge gained through his studies in the University of Nicosia's MSc course in Digital Currency, Christian initiated, and is overseeing, the integration of smart contracts and digital currency into the Qravity platform. Chris is an accomplished project manager, blockchain consultant, and business analyst with 10 years’ experience managing large engineering projects. With his deep understanding of blockchain’s evolution and emerging market opportunities, Chris is framing the real-world application of smart contracts as they relate to Qravity’s goals and mission. With over 20 years of writing experience, Patrick is highly active in the blockchain tech space, producing and managing all forms of content, such as website copy, white papers, articles, and videos. One of Upwork’s Top-Rated writers, his articles and videos have been published on renowned news portals and blogs including The Verge and Hackernoon. Previously, Patrick managed marketing teams for O2 and AVG Technologies. As Qravity’s Chief Content Officer, Patrick is ensuring that the company’s messaging in all channels is consistent and effective. Franz is a business engineer from TU Wien with over 10 years of experience in IT project and quality management, software testing, and business consulting. With his diversified education and interdisciplinary professional background, Franz has developed a comprehensive view of the potential applications of blockchain solutions. Since the release of the Ethereum whitepaper in 2014, he has been researching and analyzing cutting-edge distributed ledger technologies. Specializing in token economics and ICO strategies, he has managed the launches of several successful token sales. Franz is helping Qravity with its business operations during and beyond its token sale. Andreas has nearly 20 years of professional software engineer experience under his belt. In 2011 he co-founded bitcoin-austria.at, a registered non-profit organisation. Following this, he spent two years working with Mycelium, where he co-created the popular Android Mycelium Wallet, which more than half a million people use to secure their savings. In 2015, he co-founded the Minebox Project, which Clearcenter acquired two years later. Andreas is a highly-respected and sought-after blockchain advisor; he is providing Qravity with his expertise in smart contracts to ensure transparency, fairness, and security for Qravity project founders, content creators, distributors, and consumers. As managing director of Capacity, Andreas is an external advisor to multiple Blockchain companies in the industry. Igor is an experienced entrepreneur who has co-founded and successfully developed several businesses in Austria, Germany, and Switzerland. He has over 12 years of experience as a management consultant, specializing in IT and reorganization projects ranging from software integration to target operating models for large clients in the financial services industry. Igor provides consultation for Qravity’s day-to-day operations. Philip studied Mathematics at Vienna University of Technology and has been operating in the blockchain sphere since 2015. He is helping Qravity increase the platform’s users from the crypto and entertainment worlds. Oliver is a partner at Stadler Völkel Attorneys at Law. His professional focus is on banking and capital markets law as well as cryptocurrency law. Oliver Völkel has particular experience in structuring new types of financings such as initial coin offerings and initial token offerings. His clients include numerous renowned domestic and foreign companies and banks. Oliver Völkel studied law at the University of Vienna and Columbia Law School in New York. In the past, he worked in the field of criminal law at the University of Vienna and in renowned international law firms. Bryan Hollmann is a New York attorney and counsel at Stadler Völkel Attorneys at Law. He specializes in U.S. securities law and cryptocurrency law. He advises clients on initial coin offerings and exempt securities offerings in the United States. Bryan Hollmann studied law in Washington D.C. and London, and has experience working in the U.S. federal government and the private sector. Alexey is a professional Python developer at SteelKiwi. He has been developing awesome projects since 2012. Alexey’s positivity, attention to detail, and exceptional back-end development skills have been vital to Qravity’s evolution. By building and implementing artful server architecture, Alexey has ensured the outstanding speed and efficiency of Qravity’s performance. Igor is a member of SteelKiwi’s QA team. He has been working in IT since 2011, and has been a QA engineer for the last two years. Igor is reviewing all of Qravity’s features and its functionality, making sure the platform delivers a seamless, bug-free experience. Pavel has been a professional Development & Operations Engineer since 2013. During this time, he worked on several highload applications, and even had a job managing cryptocurrencies in production. 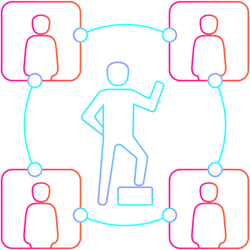 Pavel’s responsibilities with Qravity include, but are not limited to ensuring continuous integration for the platform, managing its performance, and swiftly troubleshooting whenever necessary. Łukasz is a blockchain expert with extensive experience in IT problem-solving. Through his work for both start-ups and large corporations he has developed a keen insight into IT challenges common across a wide variety of industries. Łukasz’s combined passion for economy and IT naturally led him to focus on blockchain solutions. At Qravity, he is ensuring the platform’s blockchain integration occurs securely and smoothly. Olga is a highly experienced SteelKiwi project manager who has been working in IT since 2012. She is a positive, kind, and dedicated person, willing to do whatever it takes to achieve the best results. Olga is managing the Qravity development team; her discipline and hard work has united the team and is helping them meet all deadlines and requirements. Sergey is an ambitious and visionary UI/UX designer at SteelKiwi with over five years of practical experience. Over this time, Sergey has delivered incredible results for several fascinating and challenging projects. 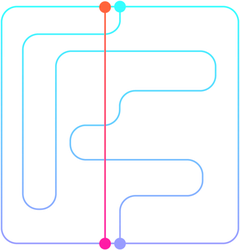 Sergey created Qravity’s stunning look, and made it logical and user-friendly. A talented communications, media relations and outreach specialist, Roxy is the Operations Manager at BigBreak10. Previously, she held the positions of Director of Digital Analytics at Sony Pictures and Communication Specialist at Cedars-Sinai. Roxy is a regular contributor to CCN, where she focuses on alternative finance, crowdfunding, and ICOs. Victoria is a seasoned analyst who leverages data to solve business problems and improve performance and is proficient in cross-channel marketing. At Bigbreak101, she is the Principal Data Analyst, and is providing Qravity with her UI/UX design and data visualization expertise. Following a string of noteworthy accomplishments as Lead Artist at the former Vienna-based Rockstar Games Studio, Michael earned renown as an award-winning freelance character designer and animator. On top of being Qravity’s Platform Advisor, he is the Lead Artist and Project Manager for the platform’s pilot project, Lizzard Maddoxx, an original feature-length animated film. Michael has an intimate understanding of the challenges of producing and distributing animated content, and is devoted to helping future producers and creators bring their visions and talents to global audiences. Christian has worked as a storyboard artist and 3D character designer in the video game and film industry for several years. After working on animations for commercials and The Sting 2, a video game, he moved onto develop concepts for animated TV series and feature films. He has also illustrated print cartoons for art magazines and art agencies. Christian’s combined experience in script writing, directing, and camera operation, and his experience in animation for films and TV and visionary concepts, make him Qravity’s ideal first project founder – as the Creator and Art Director of Lizzard Maddoxx. Kieran has eight years’ experience producing copy and developing communications for the market’s leading global corporations and startups. He specializes in developing the brand identity of ‘bleeding-edge’ companies that are innovating in uncharted spaces and developing new solutions to legacy problems. This naturally led him to focus on blockchain-based solutions. As Qravity’s Brand and Marketing Advisor, Kieran is responsible for developing Qravity’s brand, communications, and marketing for, and beyond, the company’s ICO, ensuring the platform’s unique offering is effectively communicated to audiences. Valeria is a senior frontend developer at SteelKiwi who has been developing beautiful websites since 2013. She created the client side of Qravity and made sure that it looks and works perfectly, meeting the expectations of even the most demanding users. In particular, Valeria is responsible for the complex animation on the main page, which highlights Qravity‘s advantages. Vlad’s journey in information technology began in 2014, when he started working at a startup called Mevics. There he developed Android applications, server- and client-side of web apps, managed the Android development team, and even worked as a CTO. He is a member of SteelKiwi’s team since the beginning of 2018, and has already participated in several successful projects, including Qravity, where he currently uses React for frontend development. Submit your email to receive updates about Qravity. We're a team of innovators dedicated to helping creative visionaries produce, and profit from, premium digital entertainment. © Qravity, 2018. All Rights Reserved. Enter your email for updates about the Qravity token sale, and get all the latest Qravity news. Please check your email to confirm your participation in the Qravity token sale. Thank you for joining Qravity! Please check your email for details. If you don’t see it in your inbox, please check your spam folder. The business purpose of the company is to provide IT-services and the operation of a web platform and software development. Chamber: Austrian Chamber of Economics (www.wko.at). Regulatory Authority: District Administration for Vienna. Legal and Professional Law Provisions: E-Commerce Act (www.ris.bka.gv.at); Trade Regulation Code (www.ris.bka.gv.at); Media Act (www.ris.bka.gv.at); Commercial Code (www.ris.bka.gv.at). Scope of the Companies’ Activities: Commercial Business not including regulated cases of Commercial Business and Commercial Agent. Form of Business: Unregulated.